Christmas lantern or parol making is a folk craft. Most Filipino kids have tried their hand at making a parol at one time or another. The most basic parol can be easily constructed with just ten bamboo sticks, colored paper, and glue. Selling Christmas lantern is a good business idea to start to have an additional income this coming Christmas season. Step 1: Make a V-shape with four sticks. Place the ends of 2 sticks with smooth sides up, over 2 sticks with smooth sides down and tie them with 8 turns of string, 1/2 inch from the ends. Form a “V” by separating 2 sticks having opposite sides. Step 2: Insert 2 sticks to the “V”, overlapping as shown, and then tie with 8 turns of string at joint 2. 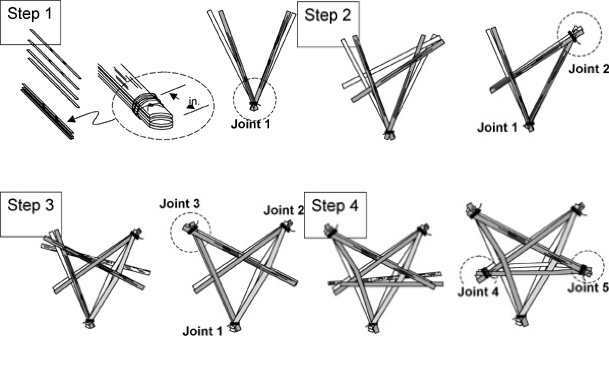 Step 3: Insert 2 sticks between joints 1 & 2, overlapping sticks as shown, then tie at joint 3. Step 4: Between joints 1&2, insert two sticks, again in overlapping pattern. Now tie the ends at joints 4 & 5. Step 5: Align the frame to make a symmetrical five-sided star. Step 6: Insert the posts at five points by pulling apart the star frame. Tying with string is not needed as the tension of the frame will hold the posts in place. Congratulations! You now have a nice frame, so its time to decorate! First, select the colors for the sides, the front and back, and the tassels. Then cut triangular pieces of rice paper, apply paste to the frame and attach the paper. Cut the excess paper. Do the same for the front and back pentagons at the center. You can make 2 or 4 tassels, put a decorated ring around the parol, or use lights. Wala kaming bamboo flat sticks. Barbeque sticks lang, paano ba yun?? ?